Tania Groth is the New Spokesperson of the For Freedom Movement in Denmark. This is an exciting endeavour, but also daunting and costly. Please help support this very important Organization. 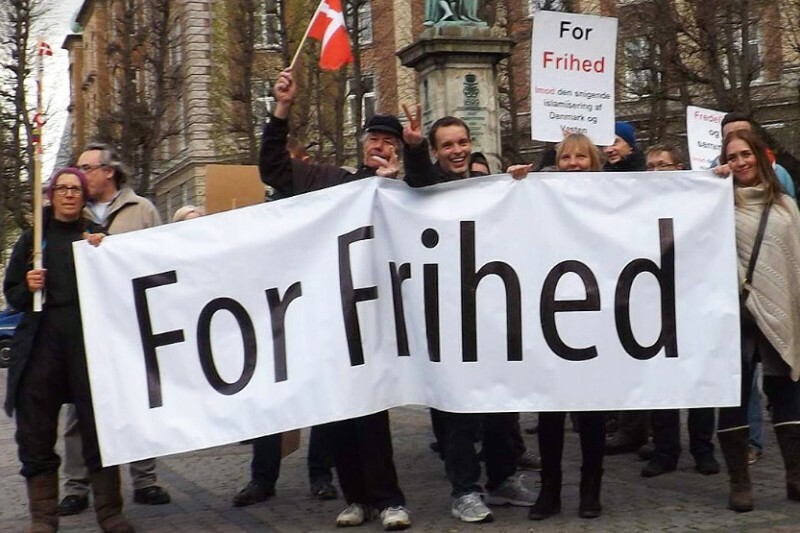 against the creeping Islamism of Denmark and the West. Everybody who is concerned about freedom of speech and democracy is welcome, regardless of background. We walk with signs such as "For Freedom", "Peaceful and Together, against the creeping Islamism of Denmark and the West” ”No to Mosques”, "No to Islamic oppression of women” and “No to violence and racism” and similar slogans. We do not accept racism, Nazism or any other form of extremism. Fundamental Islam is slowly creeping more and more into our society. It is threatening our freedom – and, first and foremost - our freedom of expression. There is only one way to protect it and that is by using it! Our Freedom must be protected at all cost. • Make our politicians wake up! Fundamentalism Islam is, these years, creeping into our society. This means terror because Islam preaches holy war (Jihad). Yet again, Europe is plagued by the persecution of Jews (especially), because the Muslims long awaited day of judgement will only arrive (according to them) when they have killed all Jews. Islamism means that our freedom of expression is under threat because critique of Islam means a death sentence which makes many fear to speak out (self censure). It means increased criminal activity because Muslims don’t feel that they have to follow democratic law. It means a barbaric view of women is taking root in ghetto’s and women’s crisis centers because Muslim men, according to Islam are encouraged to beat women (honor violence) or to outright kill them (honor killing) if they don’t follow Islamic law, the sharia. At the same time, the intolerant laws of Islam are, in many places, now displacing our secular Danish culture. For example, more and more mosques are being built, Halal food is being forced on our schools, day care centers and other places and other things, like segregated swimming at our pools is starting to be instigated. Any freedom of expression demonstration or arrangement can only be held under significant police protection. This is not a way to live in a free and democratic Western country!